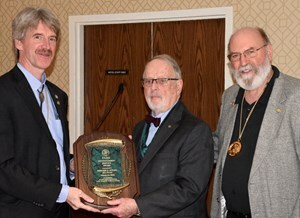 Edward G. Stiles, DO, FAAO, of Lexington, Kentucky, received the Distinguished Service Award from the Committee on Fellowship in the American Academy of Osteopathy (AAO) on March 23 at the Academy’s annual Convocation in Dallas. The Fellow of the American Academy of Osteopathy (FAAO) Distinguished Service Award is presented to fellows who have distinguished themselves in contributions to osteopathic literature; development of osteopathic theories, methods or procedures; research; osteopathic education; service to the AAO; public relations; service to public health; or osteopathic medical economics and advocacy. Dr. Stiles, a 1965 graduate of the A.T. Still University–Kirksville College of Osteopathic Medicine in Missouri, completed an internship at Waterville Hospital in Waterville, Maine. In 1968, Dr. Stiles was honored to assume the Cambridge, Massachusetts, practice of internationally recognized physician Perrin T. Wilson, DO, the first president of the Academy of Applied Osteopathy (now the American Academy of Osteopathy). In 1973, Dr. Stiles established and served as the director of the first hospital-based osteopathic manipulative treatment service in the country at Waterville Osteopathic Hospital, which served as a model for the osteopathic profession. As the director of the Waterville Osteopathic Hospital, he was involved in developing the first five-level osteopathic manipulative treatment (OMT) coding system with Medicare which eventually was modified and utilized by the Current Procedural Terminology coding system. He also served as an adviser to the published Model Criteria for Screening: Professional Standards Review Organization at what was the United States Department of Health, Education and Welfare, defending and supporting the osteopathic component of this model. Dr. Stiles then established an OMT practice in Norman, Oklahoma, and he served as professor and chair of the Osteopathic Principles and Practice (OPP) Department at the Oklahoma State University College of Osteopathic Medicine. He also has served as a clinical professor of biomechanics at the Michigan State University College of Osteopathic Medicine, and he currently serves as director of musculoskeletal medicine at the Pikeville Medical Center and as professor in the OPP Department at the University of Pikeville–Kentucky College Osteopathic Medicine (UP-KYCOM). Dr. Stiles, an honorary life member of the AAO, has received numerous honors from the AAO, including the Andrew Taylor Still Medallion of Honor. Named for the founder of osteopathic medicine, the A. T. Still Medallion of Honor recognizes AAO members who have exhibited an exceptional understanding and application of osteopathic principles and concepts and for outstanding accomplishments in scientific or professional affairs. Dr. Stiles also has been honored with American Osteopathic Association’s House of Delegates A. T. Still Memorial Lecture Award and the AOA’s Great Pioneer of Osteopathic Medicine Award.